The domain within your query sequence starts at position 633 and ends at position 667; the E-value for the SAP domain shown below is 5.25e-9. 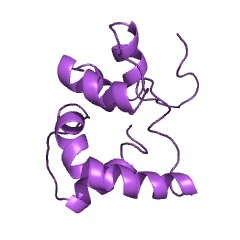 The SAP motif is a 35-residue motif, which has been named after SAF-A/B, Acinus and PIAS, three proteins known to contain it. 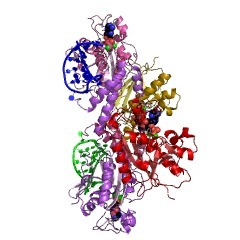 The SAP motif is found in a variety of nuclear proteins involved in transcription, DNA repair, RNA processing or apoptotic chromatin degradation. As the sap motif of SAF-A has been shown to be essential for specific DNA binding activity, it has been proposed that it could be a DNA-binding motif [(PUBMED:10694879)]. A multiple alignment of the SAP motif reveals a bipartite distribution of strongly conserved hydrophobic, polar and bulky amino acids separated by a region that contains a glycine. 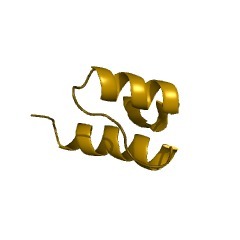 Secondary structure predictions suggest that the SAP motif could form two alpha helices separated by a turn [(PUBMED:10694879)]. Vertebrate scaffold attachment factors A and B (SAF-A/B). 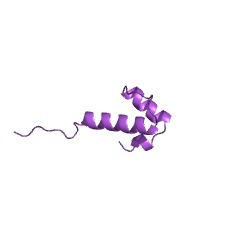 These two proteins are heterogeneous nuclear ribonucleoproteins (hnRNPs) that bind to AT-rich chromosomal region. It has been proposed that they couple RNA metabolism to nuclear organisation [(PUBMED:10212141), (PUBMED:9671816)]. 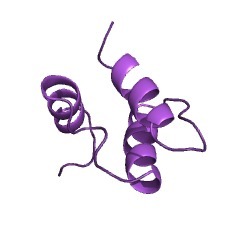 The SAF-A protein is cleaved by caspase-3 during apoptosis [(PUBMED:10671544)]. Mammalian Acinus, a protein which induces apoptotic chromatin condensation after cleavage by caspase-3 [(PUBMED:10490026)]. Acinus also contains a RNA-recognition motif. Eukaryotic proteins of the PIAS (protein inhibitor of activated STAT) family. 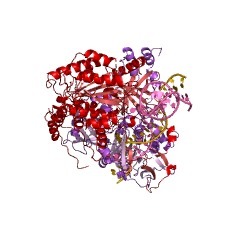 These proteins interact with phosphorylated STAT dimers and inhibit STAT mediated gene activation. 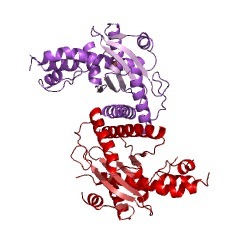 Deletion of the first 50 amino acid residues containing the SAP domain allows the interaction of PIAS1 with STAT1 monomer [(PUBMED:10805787)]. 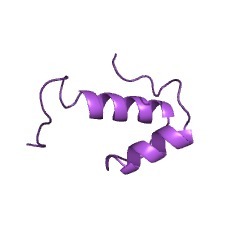 Plant poly(ADP-ribose) polymerase (PARP). 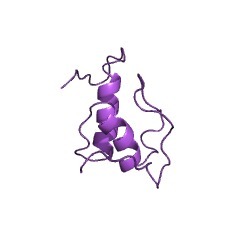 PARP is a nuclear protein that catalyzes the poly(ADP-ribosyl)ation of proteins. It is involved in responses to mild and severe oxidative stresses, by mediating DNA repair and programmed cell death processes, respectively [(PUBMED:9862413)]. 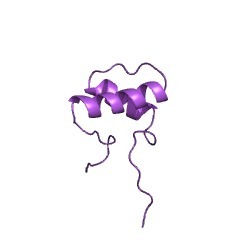 PARP is tightly bound to chromatin or nuclear matrix. 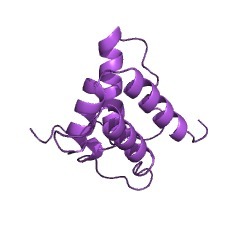 Arabidopsis thaliana Arp, an apurinic endonuclease-redox protein. 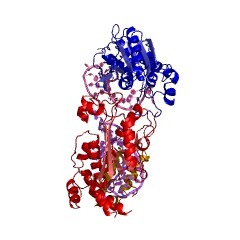 Yeast THO1 protein. 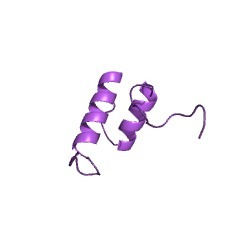 It could be involved in the regulation of transcriptional elongation by RNA polymerase II [(PUBMED:9707445)]. Animal Ku70. 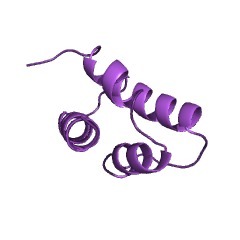 Together with Ku86, it forms a DNA ends binding complex that is involved in repairing DNA double-strand breaks. 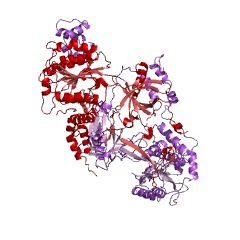 Yeast RAD18, a protein involved in DNA repair. 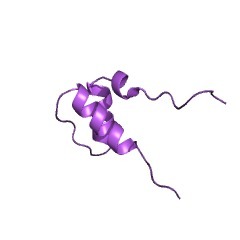 Neurospora crassa UVS-2, the homologue of RAD18. 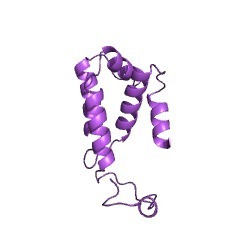 There are 19592 SAP domains in 18904 proteins in SMART's nrdb database. Taxonomic distribution of proteins containing SAP domain. This tree includes only several representative species. The complete taxonomic breakdown of all proteins with SAP domain is also avaliable. Click on the protein counts, or double click on taxonomic names to display all proteins containing SAP domain in the selected taxonomic class. SAP - a putative DNA-binding motif involved in chromosomal organization. The novel SAR-binding domain of scaffold attachment factor A (SAF-A) is a target in apoptotic nuclear breakdown. 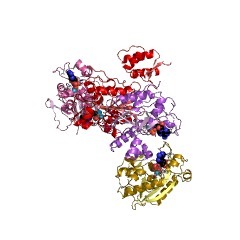 The scaffold attachment factor A (SAF-A) is an abundant component of the nuclear scaffold and of chromatin, and also occurs in heterogeneous nuclear ribonucleoprotein (hnRNP) complexes. Evidence from previous experiments had suggested that SAF-A most likely has at least two different functions, being involved both in nuclear architecture and RNA metabolism. 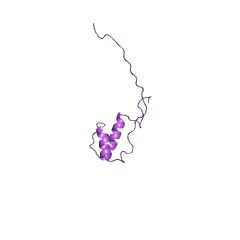 We now show that the protein has a novel scaffold-associated region (SAR)-specific bipartite DNA-binding domain which is independent from the previously identified RNA-binding domain, the RGG box. During apoptosis, but not during necrosis, SAF-A is cleaved in a caspase-dependent way. Cleavage occurs within the bipartite DNA-binding domain, resulting in a loss of DNA-binding activity and a concomitant detachment of SAF-A from nuclear structural sites. On the other hand, cleavage does not compromise the association of SAF-A with hnRNP complexes, indicating that the function of SAF-A in RNA metabolism is not affected in apoptosis. Our results suggest that detachment of SAF-A from SARs, caused by apoptotic proteolysis of its DNA-binding domain, is linked to the formation of oligonucleosomal-sized DNA fragments and could therefore contribute to nuclear breakdown in apoptotic cells. This information is based on mapping of SMART genomic protein database to KEGG orthologous groups. Percentage points are related to the number of proteins with SAP domain which could be assigned to a KEGG orthologous group, and not all proteins containing SAP domain. Please note that proteins can be included in multiple pathways, ie. the numbers above will not always add up to 100%.